An interesting horror movie from the early '90s, Candyman combines elements usually found in slasher movies with elements of the supernatural, to good effect. It is also a film which I remember being popular in the primary school playground when I was growing up. I was never allowed to watch anything too gruesome, but the film seemed very popular with other (tougher) kids, who seemed to have unfettered access to a VCR. I therefore knew the basic premise of the film from a very young age - if you say the word 'Candyman' five times in front of a mirror, the Candyman will appear behind you and stab you with the hook he has in place of a hand. While that basic idea does form part of the story, the film develops that idea in an interesting way. Virginia Madsen (looking like a cross between an early '90s Madonna, Sharon Stone and Gillian Anderson) plays a post-grad student who is looking into urban legends as a part of her thesis. 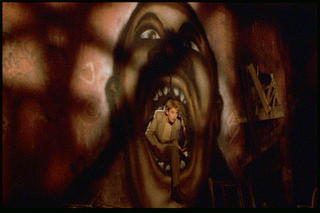 The aforementioned Candyman is just one of the urban legends which Madsen encounters as parts of her studies. However, when she learns of certain real murders in Chicago's Cabrini-Green housing projects which have distinct similarities to the urban legend, she feels compelled to investigate... I don't want to reveal too much more of the story from that point, as the plot goes in a number of rather surprising directions, and I don't intend to spoil that for anyone who hasn't seen the film. However, I would say that Candyman is rather unusual in slasher movies in featuring a genuinely gritty ghetto setting, an area so run down and menacing that it is almost as terrifying as the Candyman himself. The film definitely benefits from being shot on location - as a point of comparison, the 'urban wasteland' in Jason Takes Manhattan looks transparently fake, populated with ersatz 'street punks' straight from central casting. The cast is also strong - Madsen, Xander Berkeley (as her lecturer boyfriend) and Tony Todd (as the Candyman himself) all put in solid performances. The movie sustains a scary atmosphere for most of its running time, with a number of particularly macabre scenes, though I felt the ending was a little anticlimatic. On the whole though, a well made and enjoyable horror movie. Terence Malick's latest film is an incredibly ambitious affair, first looking at the world in an incredibly broad way - taking the viewer through the history of life on Earth - before narrowing in scope significantly, as he chronicles the life of a ten year old boy, growing up in Waco, Texas in the 1950s. I'm not sure I've ever seen a film like The Tree of Life - in some ways, that's a good thing, in others, not so good. It was certainly a challenging watch, and a number of my friends (including most of the people I went to the cinema with) didn't like it at all. For me, certain elements of the film worked very well. I thought the lighting and cinematography were dazzling throughout, I loved the visual experience of seeing the creation of the world and life on Earth on the big screen, and for the most part, the section of the film set in '50s Texas seemed very real to me, very evocative of the frictions of family life and what childhood is like during a long, hot summer holiday. 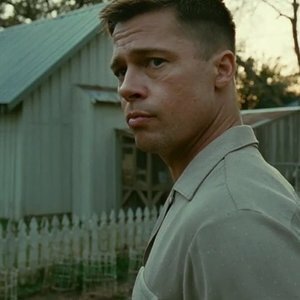 I also felt the performances of the actors in the '50s section of the film were very strong - particularly Brad Pitt (as the disciplinarian father) and Hunter McCracken (his eldest son). On the other hand, I can also sympathise with the naysayers to some extent - the film lacks a cohesive narrative, there are sections of the film which are rather dull, and I felt the ending in which (SPOILERS!) all members of the central character's family meet up on a beach (purgatory?) for a big old group hug was a little mawkish for my tastes. It's good to see a filmmaker not afraid to take some big risks and make something so ambitious, rather than simply making something mediocre, designed to offend as few people as possible. Still, I'd prefer Malick was making tighter, more focused pictures like Badlands, rather than something as meandering as the Tree of Life. 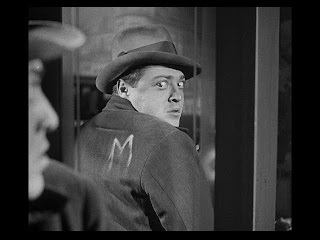 Fritz Lang's classic film noir is set in pre-Nazi Germany in the early 1930s. A compulsive murderer is preying on the children of the city and has sparked a huge manhunt by the police department. At the same time, a coalition of criminal figures from within the city, angered by the increased police interference into their activities as a result of the manhunt, are also searching for the killer; a network of all beggars and peddlers in the city has been organised to keep an eye out for anything suspicious. I was a little apprehensive about watching this movie - it's probably the oldest film I've ever seen, and I wondered if watching it might be more of a chore than a pleasure - but I was captivated throughout by the gripping storyline, as the net gradually closes in on the murderer. Fritz Lang's direction is very distinctive, utilising a number of unusual camera angles and the reflections from glass surfaces to great effect. The standout acting performance in the film comes from Peter Lorre, who plays the killer as a sad figure, haunted by his inability to stop himself from committing his monstrous crimes, and in so doing engenders a certain amount of sympathy from the audience for what could otherwise have been a wholly one dimensional character. The version of the film which I saw was an attempt to reconstruct the film as it had originally been released which meant that at times the sound dropped out - but this didn't stop me enjoying this excellent picture.